Went to Alaska. It was beautiful. That’s not what I want to talk about. What I’d rather talk about are the three valuable lessons I learned while on vacation. I know, I am supposed to be on vacation, but I can’t help it! So here they are: Be honest. Give great value. Tell a story. Let me start with the last one first (parts 2 & 3 will cover the others). So this first one actually comes from Seattle, but this was on our way to Alaska. Many people have heard about the Fish motivational video. It stars fish mongers from Pike Place Market in Seattle, and tells the story about how they turned a dirty, stinky job into something fun and energizing. They throw fish, sing songs, and choose to have a good time all day long. Oh, and they sell lots of fish. Now, if you haven’t been to Pike Place, you might think by the video and the buzz around these guys that they are the only game in town. You’d be wrong. There are a number of other fish vendors at the market, and from I could tell, their fish was just as fresh and stinky as these guys. Here is the difference. 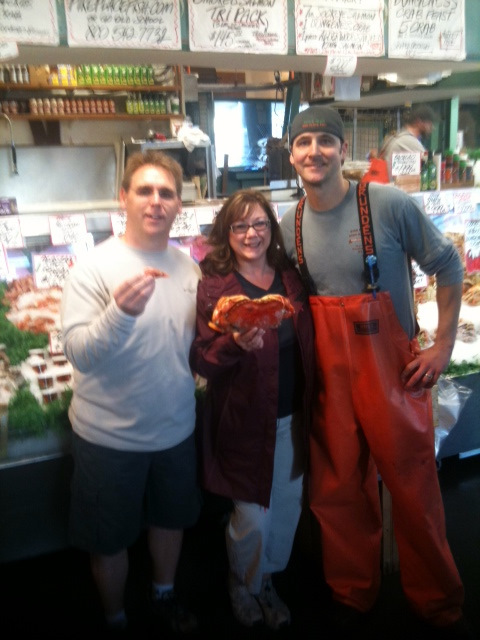 When you walk by the “world famous” fish guys, they greet you like an old friend, invite you into their world, have some fun with you, pose for pictures, and throw a fish or two. You smile, laugh, giggle, take a picture, and go home and tell your friends. You may not buy a thing, but you talked about them. Contrast that with one of the other fish vendors, literally within 100 yards of the world famous guys whose spiel includes, “We’ve got fresh Alaskan salmon, on sale today, we can ship it anywhere.” Snooze. Who do you remember and talk about (unless you are blogging)? Right. The people who have chosen to act world famous so they become world famous! So what do you and your employees think about your business? I guarantee that has an impact on the way you do business. Stay tuned for parts 2 & 3! How many times have we said to ourselves, “if I could just find that “one thing” that motivates my employees, that engages my customers or guarantees financial success, I would be good to go.”? Notice I didn’t ask IF we said it, because I know we all have. Often times we think we are missing out on the one golden nugget, one secret, one magic pill that will make all of our leadership troubles go away. And smart marketers know this is what we are looking for, even if it doesn’t exist. That’s why you see so many books, training seminars and consultants who promise to uncover the “secrets” you need to know. What I have found is that when people say they are looking for that “one thing”, what they are really looking for is a short cut. They (and you) know deep down that to be a successful leader it takes time, effort, hard work, a willingness to fail, the ability to build relationships… essentially what my friend Chris calls “stick-to-it-ive-ness”. One blog post, inspiring speech or insightful quote will not magically make your leadership life better. Time with your teams in the trenches will. With all that said, you may be wondering about the title of this post, about a leader named Karen actually finding that “one thing”. I’ll explain. While attending the Chick-Fil-A Leadercast, I happened to run into Karen, a friend and leader I had worked with in the past who is smack dab in the middle of her leadership journey. After a few of the speakers, Karen mentioned that she was really enjoying the topics, but shared that she was hoping to glean that “one thing” that would help her motivate her employees. As we were talking about some of her recent experiences with her team, she shared with me the story of one of her team members who was not comfortable interacting with customers. Karen said, “I asked her to just say hello, how are you the first time. Then when she got comfortable with that, I asked her to say hello, how are you and where are you from?” Karen told me that over about a years time, she got this team member to come out of her shell and really make a difference with the customers. Hearing this, I told her I thought she found the “one thing” without even knowing it. She got to know the strengths and weaknesses of this team member. She spent time experimenting with techniques getting this person to respond. She provided constant guidance and encouragement. Then THAT is the problem. Not that fact that you don’t know HOW to lead or motivate, but you don’t have the time to dedicate to each employee. That is a much different problem to solve. So the next time you venture out on your quest for the that one golden nugget, stop. Dig a little deeper. Ask yourself if you really know what it would take to be successful. You probably do, and you are trying to solve a problem that doesn’t exist. Your job then is to figure out what is getting in the way of doing what it takes be successful, and remove those obstacles. Of course that’s easier said than done, but it’s “one thing” you can do be a better leader.